Bowgreave Field Bridge No 56 is a minor waterways place minor waterways place place on the waterways major waterways place village town city on the Lancaster Canal (Main Line) between Ribble Link - Lancaster Canal Junction (14 miles to the south) and Lodge Hill Junction (Junction with Lancaster Canal - Glasson Dock Branch) (8 miles and 5 furlongs to the north). 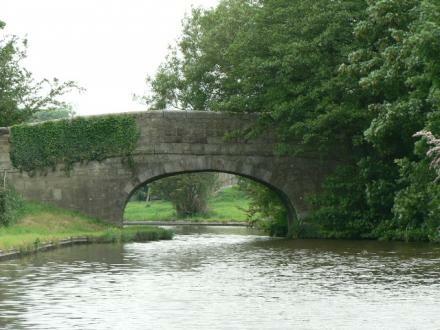 The nearest place in the direction of Ribble Link - Lancaster Canal Junction is Dobsons Bridge No 55; 2¾ furlongs away. The nearest place in the direction of Lodge Hill Junction is Greenhalgh Castle Bridge No 57; 1¼ furlongs away. Bonds Lane, Lancaster, PR3 1 — 1191 yards to the west. Catterall — 1584 yards to the south. Garstang — 1509 yards to the west. 7 Pringle Court, Preston, PR3 1LN — 1405 yards to the northwest. Garstang, PR3 1 — 1400 yards to the northwest. Church Street, Preston, PR1 3BU — 1455 yards to the west. 3 High St, Garstang, PR31 — 1362 yards to the northwest. Bowgreave Drive, Garstang, Preston, PR3 1YE — 1071 yards to the southwest. High Street, Garstang, PR3 1EA — 1436 yards to the northwest. Garstang — 1285 yards to the west. 10 Croston Rd, Lancaster, PR3 1FL — 1496 yards to the northwest. The Old Stables, Park Hill Rd, Garstang, PR3 1EL — 1435 yards to the northwest. High street Lancaster Road,Garstang, Garstang, PR3 1FU — 1367 yards to the northwest. Bridge St., Preston, PR3 1YB — 1239 yards to the west. Church Street, Garstang, PR3 1PA — 1480 yards to the west. Suite 5, First Floor, Cherestanc Square, Garstang, PR3 1EF — 1492 yards to the northwest. Preston — 1343 yards to the northwest. Stoops Weind, Garstang, PR3 1 — 1422 yards to the northwest. Garstang — 851 yards to the northwest. Abacus House, 8 Rope Walk, Garstang, Preston, PR3 1NS — 1551 yards to the northwest. Church Street, Garstang, Preston — 1511 yards to the west. Garstang — 1363 yards to the northwest. Unit 3 Balliniska Business Park, Springtown Industrial Estate, Derry, BT48 0NA — 1343 yards to the northwest. 63a Church Street, Lancaster — 1540 yards to the west. High Street, Garstang, PR3 1ZA — 1436 yards to the northwest. The Boat and Outboard Centre, Unit 4, Bridgehouse marina, Garstang, PR3 0JJ — 1228 yards to the west. Wigan — 588 yards to the northwest. Unit 2 Market Place Court,Market Place,Garstang, Preston, PR3-1ZA — 1343 yards to the northwest. Parkhill Road, Garstang, PR3 1EL — 1457 yards to the northwest. Church Street, Lancaster, PR1 3 — 1455 yards to the west. Garstang, PR3 1LL — 1388 yards to the northwest. High Street, Lancaster, PR3 1EA — 1462 yards to the northwest. -, Preston, PR3 1YB — 1386 yards to the west. Windsor Rd, Preston, PR3 1ED — 1636 yards to the northwest. Garstang Golf Club, Garstang, PR3 1YE — 1318 yards to the west. Croston Road, Garstang, PR3 1EL — 1510 yards to the northwest. Preston — 1579 yards to the northwest. Thomas's Weind, Garstang, PR3 1LL — 1394 yards to the northwest. Garstang — 1432 yards to the northwest.